As we all know, following lengthy public consultation, the Council formall y adopted the Churchgate Planning Brief in 2005. That Brief drew a distinction between development and enhancement allowing development on Areas 1, 2 and 3 (Churchgate, the market and Biggin Lane car park) but enhancement only on Areas 4 and 5, St Mary’s Square and Portmill Lane. It specifically required retention of the “key open views of St Mary’s Church, particularly from Queen Street”. The meaning of this was quite clear to everyone – public and Councillors – who took part in the consultation process. A development of any magnitude such as this must, by law, be advertised in the Official Journal of the European Union (OJEU), and when the Council did this, they specifically required compliance with the Planning Brief. 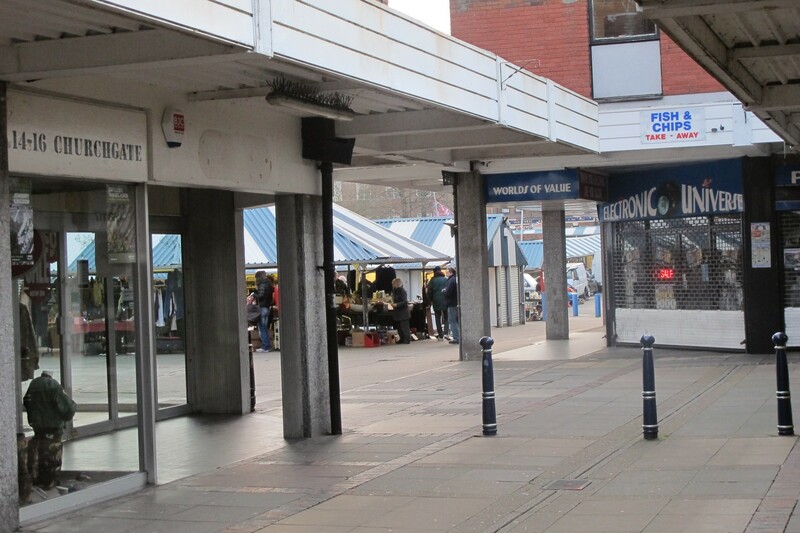 The advertisement states that the Council “would like to see a scheme taking a comprehensive approach to the development of Churchgate and the Enhancement Area. However it may also give consideration to individual elements which fit within the framework of the Churchgate Development Area Planning Brief, adopted in 2005…..(quotation continued below)”. Quite clearly, the Council hoped for a scheme for the whole area, development and enhancement, but was also prepared to consider proposals for part only. The over-riding requirement however was that any proposals had to comply with the 2005 Planning Brief. The advertisement invited interested parties to apply for an Information Pack. That pack was brief – two pages plus two plans – but it confirmed the wording of the advertisement in requiring compliance with the Brief. For a variety of reasons, other developers fell by the wayside, but it appears likely that they may have recognised that the scheme requested would not be viable. Only Simons remained in negotiation with the Council, signing up to a Development Agreement – a legal contract – to deliver a scheme that complied with the Planning Brief and the advertisement. That contract states that there are specific Objectives in its creation, and these include the requirements of the Churchgate Planning Brief, which are detailed in the contract in full. The obligation therefore to enhance St Mary’s Square and Portmill Lane rather than develop them and to retain the “key open views of St Mary’s Church particularly from Queen Street” were clearly embodied in the original Brief, the OJEU advertisement, the developer Information Pack and Simons’ legally binding contract. If the Council now goes back on this and approves any scheme that does not comply with these requirements, it will not only be breaking faith with the electorate who participated in the drawing up of the Brief, but it will also be in conflict with its own contract. More importantly it appears that it would be breaking European Union law in proceeding with a scheme that was effectively not advertised in the OJEU. A second point has now also arisen. In a letter to local organisations the Leader of the Council has claimed that there was always the intention to promote a development scheme on the entire area, and has mentioned this as being phased, with the development of St Mary’s Square and Portmill Lane being intended for 2015. This is of course a completely new idea which has never been consulted upon and is not the understanding of the public who worked so hard with the Council to create the adopted Planning Brief! However, the Leader has suggested that the slippage in delivery of the original scheme is such that the Council is now entitled to consider the “2015 phase”, with development all over the entire area surrounding the Church. However, the advertisement that the Council placed in the OJEU does not allow this. The quotation from the advertisement in paragraph two above goes on to say “….and which will not compromise the ultimate development of the overall area”. It therefore does not permit any future phases of development, because it expressly excludes any development that exceeds the Brief. Simons’ representatives have stated in public that they have every intention of building on St Mary’s Square (public meeting of Churchgate Liaison Forum, Church House, 23 March 2011). If the Council allows this to happen, and approves a scheme that does not comply with the Planning Brief and the OJEU advert, it seems that it will be breaking EU law on two separate counts, and EU law has the full force of UK law.